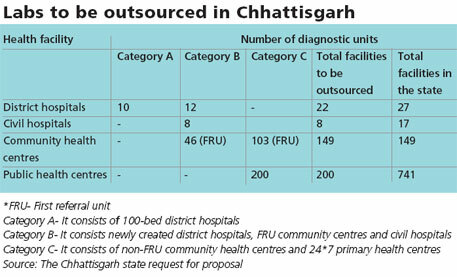 Will Bihar’s failed model of outsourcing diagnostic services work in Chhattisgarh? Despite protests by health activists, the Chhattisgarh government seems determined to take the private route for medical diagnostic services. On January 31, people held protests in Raipur, demanding the government scrap the public-private partnership (PPP) for radiology and laboratory services. They say it will undermine the state’s public health system and make medical services expensive. The state health department had issued an online request last December to elicit bids for services in 379 public health facilities, including community health centres, and civil hospitals (see ‘Labs to be outsourced in Chhattisgarh’). In the wake of the criticism, the government re-issued the bid request with just a few changes. As per the project proposal, the state will sign an agreement with the selected private agency or agencies for 10 years with a provision of annual renewal. The agency can operate the centres directly through staff members hired by it, or they can engage concessionaires to run the facilities. The government will provide space, along with an electricity meter connection, for the laboratory and radiology centres. The project mostly covers non-remote areas where lab facilities are already present, says Sulakshana Nandi of NGO Jan Swasthya Abhiyan. “What will happen to the equipment in the existing facilities? Instead of improving existing services, the project will replace them with private ones.” Another provision, which is a major bone of contention, is that the private agency can use diagnostic centres to serve external customers. “Serving external patients could disturb the entire mechanism. Patients for whom the system is meant may become secondary,” says Nandi. A third party selected through bidding will monitor the performance of the facilities based on a standard set by the government. The standard is: performance shall be treated as satisfactory if the private agency gives more than 90 per cent results for routine tests within 24 hours, and in four hours in emergency cases. As per the proposal, the government will bear the expenses of patients being treated under Rashtriya Suraksha Bima Yojana (RSBY), which caters to people from BPL families, and Mukhyamantri Swasthya Bima Yojana (MSBY), which serves those not in the BPL category. What’s more, BPL patients in OPD will not be charged. “This way people from all the sections would get diagnostic facilities,” says state health commissioner Pratap Singh. But this is not clear from the proposal, experts point out. There are 1.9 million BPL households in the state. And while dealing with its food security bill, the state had promised to support 4.2 million poor families. It remains unclear whether all the poor families will get any help in the new facilities. 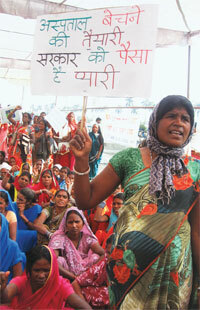 The Chhattisgarh project is not a novel one. Two years ago, Bihar had outsourced diagnostic services of its primary health centres to groups like Dr Lal Pathlabs. The project, under National Rural Health Mission (NRHM), has been termed a failure. Bihar NRHM mission director Sanjay Kumar accepts that the state must develop its own capacity on minimum level of facilities and that otherwise quality control will become difficult. “In outsourcing, private players take the deal as opening shops at health centres, and their sole concern is to make money,” he admits. When the government forces the private parties to move from district level to remote areas, they open collection centres and only collect samples, he adds. According to Shakeel, coordinator of Patna NGO Centre for Health and Resource Management, outsourcing of medical facilities has weakened resources. “Earlier, patients were getting free services but once the diagnostic services were outsourced, even BPL card holders were charged. Now it is too late to go back to the public sector as the government’s own resources have vanished,” he says. If the government wants to outsource, it must be only for high-end services, suggests Shakeel. Defending the initiative of Chhattisgarh, the state health commissioner Singh says, “Due to lack of human resources and infrastructure, the government has opted to outsource.” When asked about the Bihar model, Singh said the state health resource centre (SHRC) in Chhattisgarh has conducted a thorough study. “The Chhattisgarh project was formulated keeping the bottlenecks in mind,” he adds. The existence of the study, however, is in question. When executive director of SHRC was contacted, he claimed he had carried out the study himself. When asked for a copy of the study, he said, “There is nothing documented as such.”According to sources in the state health department, no such study exists. The government cannot abdicate its responsibility of being the healthcare provider and become a mere fund-provider to the public health needs, says Yogesh Jain of NGO Jan Swasthya Sahyog. An expert, who wishes to remain anonymous, adds, “If the government had outsourced some specialised work, it was understandable. But basic diagnostic services like blood and urine tests could be done by the government staff.” Outsourcing these services is not going to be cheaper or better, he contends. Activists say instead of following Bihar, Chhattisgarh should take its cue from Tamil Nadu where the public health system is working well. The state’s success mantra is: “Small equipments and trained staff,” says P Padmanabhan, former secretary with the Tamil Nadu government and adviser in NRHM’s National Health Systems Resource Centre (Public Health Administration). “Tamil Nadu purchased these equipment with funds from NRHM and trained its staff who can diagnose 500 people in one day,” he adds.